ASCO Sintering is an award-winning custom manufacturer of latchbolts utilizing the powdered metallurgy manufacturing process. 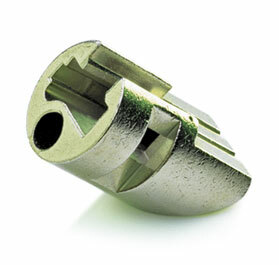 ASCO Sintering in 1997 received the Non- Ferrous Grand Prize from the Metal Powder Industries Federation (MPIF) in recognition of their latchbolt (lock assembly) used in lock hardware applications. Latchbolts used in the assembly exceed the American National Standards Institute (ANSI) Standard “Grade 1 Lockset” requirement for pre-assembled locks and latches, thereby satisfying the 800,000 minimum cycle test. Producing latchbolts using the powdered metallurgy manufacturing process resulted in substantial annual cost savings. ASCO’s multi-level design handled concerns with density distribution, deflection, and side loading of fragile tool components that was caused by the complex internal shape of the latchbolt. The powdered metallurgy manufacturing process included sintering / secondary operations – both milling and nickel plating. Other advantages of producing the latchbolt utilizing the powdered metallurgy process include excellent ability to withstand fire, endure the harsh environment of the natural elements, as well as great strength properties such as impact resistance. In addition, a wide variety of materials are available to produce powdered metal latchbolts that allow for cosmetic, structural and security require including plated steels, brass and stainless steel grades. ASCO Sintering supplies the transportation, lock hardware, lawn & garden, irrigation, medical, hand tool, computer and cutlery industries. Capabilities include tool design, tool manufacturing, complete metallurgical lab, warm-compaction, high-temperature sintering, sinter hardening, heat-treat, resin-impregnation, deburring, secondary machining, assembly and plating. Materials include low-alloy, diffusion alloyed steel, copper, infiltrated steels, stainless steel grades 300 and 400, brass, nickel silver, Monel®, soft magnetics iron, and bronze. ASCO Sintering has over 50 years of experience engineering components that meet strict tolerances as well as reduce total program costs.